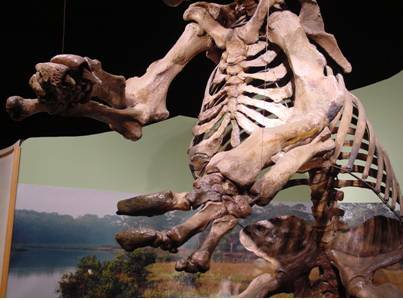 Eremotherium is the largest of the Giant Ground Sloths in North America, and the largest land animal, to live, in Florida. 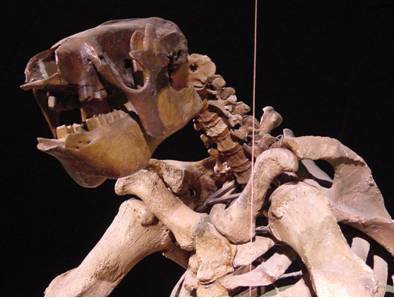 This late Pleistocene herbivore was 20 ft. (6M) tall and weighed in at 3-5 tons. It used its giant tail to brace it upright, while feeding on large amounts of twigs and leaves. This Prehistoric Megafauna was estimated to have eaten 300-500 pounds of vegetation per day. Preferring to live near swamps and wooded areas where food was abundant. It had huge “brick-shaped” teeth consisting of 5 upper teeth and 4 lower teeth. The top of the teeth have a distinctive V-shaped notch that fit together exactly with both upper and lower teeth. These teeth have no enamel on them. It has large feet with just one claw, on the back foot, and 2 claws, on the front foot, that measures 12 inches long or more. These claws were used for digging tubers and reaching high branches for leaves. It also, deterred it's enemies. Few predators would challenge this large vegetarian. 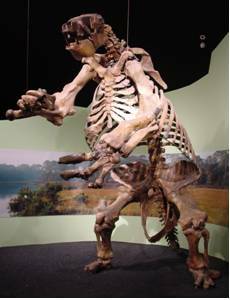 The most impressive of these Giant Ground Sloths was discovered in October 1975, from South Daytona Beach, Volusia County, Florida. This 60-80 year old individual specimen was dated at 130,000 years ago and measured 12 feet high, 16 feet long and 5 feet wide. 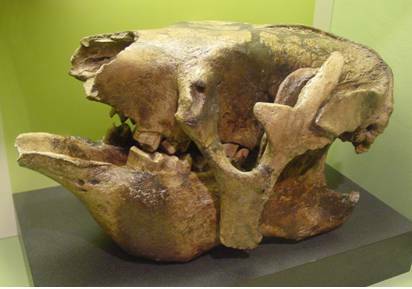 Another species, in Florida, is eomigrans which is older and dates back to the late Pliocene and early Pleistocene Periods. It is known for having more than two claws on its front foot.